The connections of Captain Redbeard were very pleased to see he has got into the top 40 and therefore guarateed a run in Saturdays Showpeice. The going at Aintree will come under scrutiny once again this year. The clerk of the course will want some soft in the description of the going. The ground currently good on the Mildmay and hurdle courses and good, good to soft in places on the Grand National course. The overnight rain forecasted at Aintree will test the skills of Andrew Tulloch over the next few days. With multiple entries Gordon Elliott places his jockeys in the Grand national. With Bristol De Mai set to run in the Aintree Bowl the weights all set to rise in the Grand National. 10/03/19 Cheltenham Festival Update : 18 in the curtain raiser! Anti-post favourite Al Dancer head a list of 18 declared for the opening race , the Supreme Novice hurdle at the festival. Always good to keep an eye on the forecast for the festival. 27/02/19 Cheltenham festival update: Penhill out of "Stayers"
Last years winner will not run! Rain forcast for this weekend puts selective watering st Cheltenham on hold. 26/02/19 Cheltenham festival update: Paul Nicholls has high hopes for Gold Cup! Clan Des Obeaux raises hopes of Gold Cup glory again. Before making making decisions on Cheltenham races there are many factors to take into account. Gold Cup winning trends simply can't be ignored. Welsh Trainer Evan Wlliams hopes for good run from his six year old Silver Streak at the festival. It's never too early for Cheltanham news and the Stayers hurdle information here. With the jumps season in full swing it is never too early for Cheltenham Festival tips and predictions. Don Poli schools well over Aintree fences in prep for Becher run. 04/05/18/18 All change for "At The Races"
Trainer Paul Nicholls thinks that the distance of the King George VI chase at Kempton will not prove aprblem for Politologue. 24/11/18 Stunning race in prospect today in the Betfair Chase. First leg in the Million Pound challenge today at Haydock. If any horse wins this, The King George and the Cheltenham Gold Cup they will get the 1 million pound bonus. Great race in prospect. 24/11/18 Might Bite attracting plenty of support on season debut. 14/11/18 Betvictor Gold Cup looks all set. A big strong field in prospect in Chetenhms biggest race so far the Betvictor Gold Cup on Saturday. 14/11/18 Footpad : Ruby expailns what went wrong. Footpad's jockey Ruby Walsh explains that a few jumpping error went against the horse last weekend. 14/11/18 Morgiana Hurdle. looking to be hot race. Faugheen shortening in the betting market but the Morgiana Hurdle looks a hot race with rivals Samcro and Supasundae both entered..
06/11/18 Kalashnikov make a winning start to his chasing career. Long way win for this very smart prospect. 06/11/18 First Britsh Win in Austrailia's Race that stops a nation. 31/10/18 Jump season now getting going with Saturdays Charlie Hall Chase. Charlie Hall Chase carries on the opening part of the jump season. Our preview. 26/10/18 Good field for The Old Roan Chase. Sunday sees Aintrees season opener and a good field of runners for The Monet's Garden Old Roan Chase. Our preview. 24/10/18 Breeders' Cup news: Roaring Lion kickback worry. 29/05/18 Derby News: Roaring Lion jockey very upbeat. 25/05/18 News: Goodwood Betting Tips. 25/05/18 News: Four chances for O'Brien in Irish 1000 Guineas. 24/05/18 News: Poet's Word shows class in the Brigadier Gerard Stakes. Jockey change in GRAND NATIONAL . Richard Johnson will now ride SAINT ARE in the national. Grand National day is here. Importent changes to the field and non-runners today. See latest list of runners here ! Footpad ruled out of Aintree in favour of Irish run? Buveur D'Air will not bid for back-to-back victories in Thursday's Betway Aintree Hurdle due to an unsatisfactory trachea wash.
Will the Irish finally take a back seat for one day? 01/03/18 News: Festival odds still require close inspection. Value still available for festival races? 10/02/18 News: Faugheen beaten in the Irish Champion Hurdle! Yes "The Machine" Faugheen beaten in the Irish Champion Hurdle! but there still remains a question. Should Punters Still Back Faugheen for Champion Hurdle? We all need help with Cheltenham betting, here are some insider tips. Looking for previews for the festival? here is your day 2 information. Altior will get a run in the Gamespirit chase at Newbury inprep for the Festival. 04/02/18 News: Samcro to run in Champion Hurdle? Robbie Power thinks he saw a potential Champion Hurdle winner. 31/01/18 News: 5 Jockeys to Watch at Cheltenham. With the Cheltenham festival looming many racegoers and the betting public have a vast array of stats to take into account for the best jump racing festival in the world. Form, going and course form and very important but one factor that must not be left out of any judgment is jockeyship. Here are five of the best for you to consider. 31/01/18 News: Samcro in great form. Gordon Elliott reports big Leopardstown hope Samcro 'in great form', and confirms that this unbeaten star will go for one of the novice events at the Cheltenham Festival. 25/01/18 News: Davy Russell booked for L'Ami Serge in Doncaster Chase. With regular jocket Daryl Jacob riding Gold Cup hopful, Bristol De Mai at Cheltenham on Saturday, Davy Russell get the ride on L'Ami Serge in the Sky Bet Chase at Doncaster. 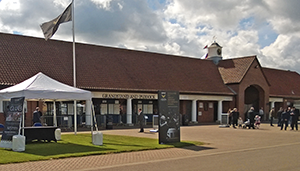 The Headquarters of British Flat Racing. The home of the Derby. The Royal racecourse in Berkshire. Ffos Las in Carmarthenshire is the UK's newest racecourse. National hunts blue ribbon race is held at Cheltenham racecourse over 3 miles 2 furlongs. The top race of the season for champion hurdlers run over 2 miles. Often referred to as The Welsh Grand National this is the premier race held in wales.. Here in the UK we are very lucky as our horseracing has a lot of variety as well as some of the best thoroughbreds taking part in the races. We have two main categories of racing in the UK flat racing and National Hunt racing. Flat racing is run over varying distances from five furlongs to the longest race which is the Queen Alexandra stakes at Royal Ascot which is over 2 miles and six furlongs. Flat racing for thoroughbreds follows a pattern set out by the authorities and tries to obtain the best from thoroughbreds of all ages during the season. The highest races in stature are the five classic races held each year for three-year-olds these are: The 2000 Guineas (Open to Colts and Fillies), The 1000 Guineas (open to fillies only), the Epsom Oaks (open to fillies only), the Derby (open to Colts and fillies) and the St Leger (open to Colts and fillies). These are the top five races held every year and form the UK Triple Crown which is where a horse wins the 2000 Guineas, the Epsom Derby and the St Leger; however there is also a fillies Triple Crown where a filly has to win the 1000 Guineas, the Epsom Oaks and the St Leger. Just below this class of race we have Group One races which include the classics but other races of importance internationally. Next we have Group 2 races, Group 3 races, and then we have listed races. Next are handicap races. There are also different types of races such as maidens and beginners races for horses just starting out on their careers. We have had some of the world’s best racehorses running in this country and 2012 has been a complete bonus year with the highest rated flat horse ever Frankel staying in training for his fourth year. He reached a rating of 147 which is two points higher than any other racehorse and was this year generally considered one of the best horses we have seen. A classic winner Frankel won the 2000 Guineas in a style never before seen when he went off in front and was leading by 15 lengths at halfway and never looked like being defeated winning the race by six lengths. He also won the St James's Palace stakes, the Sussex stakes and Queen Elizabeth stakes in his three-year-old season. As a four-year-old he was asked to run over a slightly longer distance and extended his unbeaten career in his 14th race, the Champion stakes at Ascot over 10 furlongs. We have had lots of other great horses like Nijinsky who was our last Triple Crown winner in 1967. Nijinsky who's sire was Northern Dancer. Northern Dancer was one of the best sires in the world, Nijinsky also became a sire many winning horses and he sired 155 stakes or groups winners. The great Brigadier Gerard was one of the finest horses running in the early 1970s he also won the 2000 Guineas in his three-year-old season in 1971 as well as the Queen Elizabeth the second stakes. he won the Epsom Derby that day by a record 10 lengths which is the longest winning margin in the race. However this horse is famous for another reason as on 8 February 1983 Shergar was stolen and never seen again. The flat race season runs from spring through summer into the autumn however the National Hunt season starts in the autumn runs through the winter into the spring. National Hunt racing in the UK adds further dimensions to the horseracing. National Hunt racing in the UK is not only as a professional game but also an amateur game in the form of point-to-point racing. Point-to-point racing started life by horses literally racing from one point to another. The points were often steeples and hence the name steeplechasing. Point-to-point racing is still doing well in this country and is basically for horses that are not good enough, at least yet, to race in full “under rules” racing. Point-to-point racing is put on by local hunts and the races generally are over 3 miles over proper National Hunt fences. Lots of horses that run under rules start their life in point-to-point racing. Moving on to under rules racing the National Hunt racing can be split into two groups or perhaps even three. The first strangely enough is flat racing. National Hunt racing have special flat races called National Hunt flat races. These races are for horses that are young and are not good enough perhaps for full flat racing and whose careers will be in the National Hunt field. These races are often called bumpers. These National Hunt flat horses usually go on in their fourth or fifth years to become hurdlers, which takes us to the next category in National Hunt. Hurdle races in the UK by run over distances from 2 to 3 1/2 miles. The obstacle that they have to jump is called a hurdle and is a minimum of 3 1/2 feet high. It is made of wooden frame with fencing material inside. There are new hurdles that are becoming more popular now called Bush hurdles on these look more like small fences and are quite popular in French hurdle racing where horses usually progress to jumping full fences much earlier in their career. Hurdlers after a few years usually progress to chasing, this is jumping over standard fences however many horses make a career out of hurdling and either never progress to the larger obstacles or simply so much better all the hurdles that they just never change codes. There is a full range of hurdle races From Grade 1 at the top of the list through to Grade 2, Grade 3, listed and handicaps. Of course there is also the usual maiden races for horses that have not won a hurdle race in the previous season. At the bottom of the grades we have a novice hurdle this is for horses that the start of the current season have not won a hurdle race, if they win a race this season they are entitled to continue to run in the novice hurdle for the rest of the current season but usually carry a weight penalty. In Maiden races on the other hand only allows horse that have not ever won a hurdle race to run. There is a full programme of hurdle races throughout the National Hunt season and this culminates in what is the U.K.'s blue-ribbon event, The Cheltenham Festival held in March at Cheltenham racecourse. On the first day of the Cheltenham Festival the highlight of the day is a hurdle race called the Champion hurdle this is a Grade 1 National Hunt hurdle race and it is all for all horses aged four years or older. It is run over a distance of roughly 2 miles (2 miles and 110 yards) and is for the top class, fast hurdlers to take part. This is a very fast race and run championship pace it is for the fastest hurdlers in the country to test their speed over the minimum trip against other hurdlers. The first Champion hurdle was run in 1927 and was won by Blaris. Unlike the top flat races (The Classics) where horses can only run when they are three years old, in National Hunt racing horses can come back to the race in subsequent years. This is one of the most endearing things about National Hunt racing where you are able to follow horses from three or four years old when they are running in bumpers or novice hurdles run through until they run in hunter chases perhaps even in their 14th year. Because these horses can come back year after year is not unusual in some races to have horses win on more than one occasion. A horse called insurance was the first dual winner of the Champion Hurdle having won in 1932 and then follow that up in 1933. 1949 saw the first run for horse called Hatton's Grace who went on to win in 1950 and 1951 becoming the first triple winner of the race. He was closely followed by Sir Ken who won in the three following years. The fantastic Persian War also was a three-time winner in 1968, 1969 and 1970. Again in 1985 we saw another three times winner See You Then. The last three times winner occurred in 1998, 1999 and 2000 when the Aiden O'Brian trained horse Istabaq performed the triple again. In 1984 The Fabulous mare Dawn Run won the race and after being sent chasing went on to win The Cheltenham Gold Cup in 1986. Being a mare this was some feat if you consider that she was the only horse to complete the double at the time, she was only one of	two mares who ever won the Champion hurdle. Dawn Run was also the only horse ever to complete the English, Irish and French Champion	hurdle treble. Continuing with hurdling, on the third day of the Cheltenham Festival there is also a hurdle race but is for hurdlers but like longer distances. This race called the World Hurdle and is run at a distance of 3 miles. This race was initially known as the Stayers hurdle and also the Spa Hurdle but in its present version has been running since 1972 and again because horses can come back in multiple years we have had multiple winners. In 2002 the French trained Barracuda won the race and then followed it up in 2003. Inglis Dreaver went one better winning in 2005, 2007 and 2008 however in the last four years the races being dominated by the super horse Big Bucks. Big Bucks is one of those phenomena that come along every now and again. He started his racing in France where he had a little success but was then bought by the Stewart family and sent for training in the successful and powerful Paul Nicholls yard. Since then he has not really looked back. He won a beginners Chase and ran well in some novice chases including a fine win in the John Smith's Mildmay novice Chase at the Aintree Festival at the end of the 2007/2008 season. He was then tried in the Grade 3 Hennessy Gold cup Chase. He made some progress in this race but this race was to be a turning point as when the race got serious he blundered very badly and unseated his rider. The connections of the horse then decided that they would put the horse back over hurdles and his first run was on 1 January 2009. And up to the end of the 2010/2011 season the horse has not lost a race and has put up a 17 win race sequence. Not only is the 17 wins impressive but the horse is so much better t	han any other over this distance that he always wins easily and by big distances. 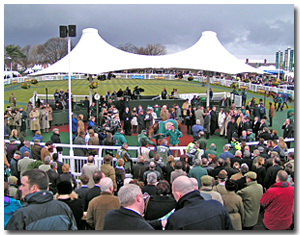 Going back to hurdle races there are some good races held after the Cheltenham Festival as Aintree racecourse now also has a festival That Is held about one month later than the Cheltenham Festival. Although this festival is not so extensive as the Cheltenham Festival and does not have the same prestige as winning at the Festival, many horses that may have run below par at the Cheltenham Festival often come to this meeting and turn the tables on horses that have beaten them at Cheltenham. Of course this meeting also has the greatest steeplechase in the world the Grand National on the final day. I stated earlier horses will run for one or two seasons as hurdlers often move on to become full National Hunt Chasers and this is seen as the natural progression for many hurdlers. Just as the hurdle races, Chase races also have a full complement of races throughout the year with early races like the Betfair Chase held in November/December, the Hennessy Gold cup in December, the King George in December and The Welsh National also in December, but all these races again lead to the Cheltenham Festival. The main event on the second day of the Cheltenham Festival is the Queen Mother Champion Chase a race for chasers over the minimum distance of 2 miles. This steeplechase is for fast and good jumpers who may not yet or may never get the longer distance of the blue Riband Gold cup distance. This is one of the fastest steeplechases running the country; only horses that can run fast and jump accurately win this race as there is little time for recovery if a mistake is made during the race. This race was established in 1959 and multiple winners include Fortria who was the first dual winner Badsworth Boy was the first triple winner and many other really good horses including Viking Flagship, One Man, Moscow Flyer, and the very smart Master Minded have won this race. The final day of the Cheltenham Festival sees the running of the blue riband race the Cheltenham Gold Cup. Seen as the most prestigious race in the whole National Hunt calendar this race is a grade one National Hunt horse race run over a distance of 3 miles and 2 1/2 furlongs. There are 22 fences to be jumped in this race and the race is run at a championship pace. The inaugural running of the race was held in 1924 When Red Splash won the race. Again we have had multiple winners and the first being a horse called Easter Hero won in 1929 and 1930. There was no race in 1931 because of frost but the race came back in the 1932 Festival and that was the start of the super horse, Golden Miller winning the race five times on the bounce. Golden Miller was the best of his time and in 1934 he won the Gold cup and the Grand National steeplechase in the same year. Also in his 1934 Grand National win he set a new course record of 9 min and 20.4 seconds. Other multiple winners of The Gold Cup Include Cottage Rake 1948 – 1950, L'escargot 1970 – 1971 but 1964 saw the best national hunt racehorse that has ever lived win the race in 1964, 1965 and 1966 the horse of course was the great Arkle. Arkle was given a time form rating of 212 this is the highest rating that is ever been issued to a steeplechaser. Arkle won 27 of his 35 starts and won from distances from 1 mile six furlongs out to 3 miles five furlongs. He also won the 1965 King George VI Chase and quite a number of handicap chases; he won the Irish Grand National carrying 12 stones, he also won the 1964 and 1965 Hennessy Gold cups and on both occasions was asked to carry the now unprecedented weight of 12 stones seven pounds he also won the Whitbread Gold cup in 1965 also carrying 12 stones seven pounds and in the 1966 Hennessy Gold cup he failed to win the race by a half of length however he had to give the winner that day 35 pounds in weight concession. Arkle was so good that handicappers often had to produce two lots of weights for when the horse was entered into a race one with him running, where more horses would have to run from out of the handicap and one without him running such was his prowess. Arkle was sometimes called a freak of nature but he was absolutely fantastic National Hunt horse. Other winners of the horseracing's blue ribbon event have gone on to greatness and probably one of the best remembered horses of our age was Desert Orchid who won the race in 1989. Desert Orchid was a fantastic front running, fence attacking grey wonder horse. His race wins include the King George VI Chase in 1986, 1988, 1989 and 1990 he was also an Irish national winner but his win in the Gold cup should be seen in the context that Cheltenham was never his best course, however on that great day the horse gave everything as he did every single time he ran in the race and despite not liking the course and perhaps not really liking the distance of the Gold cup. When he ran in the 1989 race the conditions were very cool with snow early in the day and the ground being very soft and this was not again necessarily to Desert Orchid's liking however his courage and stamina saw this horse come through and win the race when most of the other horses had cried enough. Much loved by the Br	itish public I don't think this horse will ever be forgotten. Other great winners of the Gold Cup Includes the very fine Best Mate. Best mate won the Cheltenham Gold cup three times on the trot in 2002, 2003 and 2004 unfortunately he was unable to contest any more Gold cups as he collapsed and died of a heart attack after being pulled up at Exeter racecourse in 2005. We probably never saw the full potential of this horse, a King George VI winner and also a winner of the e Peterborough Chase, also in all of his races prior to that final day Best mate was never out of the first two casting a great record by any stretch of the imagination. Another great recent winner of the Cheltenham Gold cup was Kauto Star. Kauto Star was the only horse in history to have regained the Cheltenham Gold Cup; he won the race in 2007 and then came second in 2008 to his stablemate Denman. This racing defeat was probably the most gutsy race the horse ever competed in. His stablemate Denman that year was in outstanding form but Kauto Star showed all his courage and never gave up to come second. He turned the tables on Denman the following year when he beat him by 13 lengths. Amongst his other victories Kauto Star also won The Betfair Chase in 2006, 2007, 2009 and 2011, the King George Chase five times including 2006, 2007, 2008, 2009 and 2011. An outstanding record by any horse at any time. Also at the Cheltenham Festival every race is a championship race had it takes all forms of our racing with hurdle races for hurdlers while just starting out on a career and also seasoned hurdlers over various distances and various grades, and the same range of races of course for fully fledged steeplechasers. The second Festival is held at the end of the National Hunt season at Aintree racecourse again there is a full schedule of races for hurdlers of all abilities and also chases of all abilities but the culmination of this festival is the world's greatest steeplechase Grand National. The Grand National is called the world's greatest steeplechase. It is called this for good reason the race is run at a distance of around four and a half miles (4 miles 856 yards), although the start has been moved for safety reasons for the next running in 2013 and That therefore from now on maybe a slightly shorter distance. There are 30 fences to be jumped in the Grand National, 16 on the first circuit and then a further 14 on the second circuit the Grand National is currently limited for safety reasons to 40 runners although this has not been the limit in the past and there have been as many as 66 runners taking part in the race. 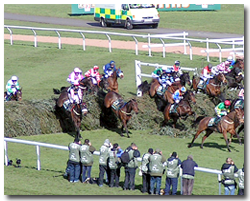 The Grand National is a unique test for horse and rider with many differing fences. In the early years the fences were perhaps even more varied as one stage the race also had hurdles to be negotiated and also for a few years a brick wall that had to be jumped. Thankfully now the fences are traditional spruce fences. Some of the fences are still unique and we have dropped fences in the race. This is where the landing side is lower than the take-off side of the fence. This often means that horses are caught unawares by this type of fence and have to be good jumpers and also well-balanced to negotiate these obstacles safely. The official first ever race was held in 1839 and was won by a horse called Lottery. However there is good evidence to suggest That the First Grand National, Although Not Call the Grand National was held in 1936 and was won by The Duke, a feat he went on to do again the following year. In 1938 race was won by Sir William. These early races were first thought to be run not at Aintree but at Maghull however it looks as if there is more and more evidence to suggest that they were run at Aintree. The first race officially, was held in 1939 and was won by lottery. During that race a well-known Jockey of the day Captain Becher fell off his horse at one of the fences and landed in the small brook that was on the landing side of the fence. This fence now holds his name as the very famous Bechers Brook, possibly the most well-known fence in the world. Actually most of the other fences also have names but only some of them have recognisable names like The Chair, the biggest obstacle in the race which often comes as a surprise to many people who think that Bechers Brook is the biggest. Another of the well-known fences is the Canal turn where horses after jumping the whole fence need to turn 90° left to continue on the racecourse. As a complete test of horsemanship horse bravery and stamina the Grand National is quite unique in the world and although there are other races such as the Velka Pardubice held in Czechoslovakia, which has many varied fences it has not the same prestige as the Grand National but is more like the cross country events that are being held more and more in the UK where a horse has to jump varying type of obstacles. The Grand National being one of our longest running long-distance chases and has had many very famous horses running in the race. In 1897 there was possibly the best Grand National horse that ever took part in the race won for the first time he was called Manifesto. Manifesto's career started quietly in 1892 when he was four years old and he ran a few races, in the following year he ran twice and again and twice in 1894. In 1895 yet again he only ran in two races one of them was a flat race or a bumper and the other was the 1895 Grand National. He ran well in the race and finished fourth. In 1896 he ran in the race again unfortunately fell first fence. 1897 things were much better for him and he won the race. Strangely the horse was sold in 1898 and during that season injured himself and therefore did not run in the race. In 1899 he was again entered in the race however he had to carry an enormous weight of 12 stones and 7 pounds there were a lot of other good horses in the race and one of the best was Ambush II but The Great Manifesto was simply too good for him. In 1900 because his reputation was so high the handicapper gave Manifesto the massive weight of 12 stones and 13 pounds to carry, not only was he to carry this weight but he was also to give every other horse in the race at least 48 Pounds. This was a massive weight and gave the horse no chance of winning however the horse gave his all and was beaten by a short head for third by Barsac. In 1901 that the age of 13 manifesto did not run in the race however in 1902 at 14 years old he was again entered to run in the national even though he was not very well fancied that day, he was allocated the top weight 12 stones and eight pounds, a ridiculous weight for any horse to carry let alone a 14-year-old. Up to then no horse never made the frame at 14 years old and also no horse had made the frame carrying 12 stones eight pounds but he finished third. In the following year unbelievably at 15 years old he was declared again to run in the race and was given 12 stones three pounds to carry, however he was not the top weight that year and he finished in third position. A 15-year-old horse would not be considered to run these days however in 1904 the age of 16 yet again he was entered in the race and was set to carry 12 stones and one pound. This should be taken into context that this weight is not allocated to horses these days for top weight, and this horse was 16 years old. Again he ran his heart out and he did finish the race albeit last of the 6 to finish. His record in the race was fourth, fell, first, first, third, third, third and unplaced a record that will never be equalled and I think he was the best horse ever to run in the Grand National. Hearing our love for evermore. 11 years after his death a survey reported that he was the best known racehorse in the UK. UK race courses are varied in design as most run in harmony with the landscape and have not been built from scratch. Also in the UK the variety of racing is unique because unlike some other countries, the USA for example where most of the tracks are oval here in the UK most of the tracks do not fit this standard track design. We have tracks that are odd shapes, undulating or flat park courses, and also run clockwise and in an anti-clockwise direction. Some of the racing in other countries horses can be trained to run as fast as possible around oval tracks where the jockeys just need to keep their mounts running as fast as possible. Here in the UK due to the diversity of the tracks the Jockey plays a more important part in keeping the horse balanced throughout the race. Taking two races with the same name, one in the USA and one in the UK, the Derby, or Epsom Derby as it's called here and its equivalent race the Kentucky Derby in the USA, these are two different races entirely. Whilst the two races are not run at exactly the same distance with the American Derby being raced over a distance of one and a quarter miles the UK equivalent is run all for one and a half miles. However both races are considered the pinnacle of the season for flat thoroughbred racehorses. There are more differences in the race than simply the small distance differences in the race. The USA race is run on an oval track at Churchill Downs in Kentucky. This race often referred to as the most exciting 2 min in sports and is run at a flat out pace along this track. Consider the difference in the UK race where instead of racing on an oval track Epsom Downs demands much more of a high-class racehorse than simply running faster than all his rivals. From the start of the race after two furlongs the track bends to the right and the horse has to start running uphill/ At around the 1 mile mark the course then tracks along the left-hand bend starting on the level and then dropping down towards the home straight, once in the home straight horses then have to run downhill until halfway up the straight when the course then starts to run uphill to the finish line however horses also have to take into consideration the camber of the racecourse which also changes during the race. Horses need to be well balanced throughout the race and it is important the jockeys do nothing to make these young colts and fillies becoming unbalanced. As you can see from this the horseracing in the UK is more complicated and varied than in many other countries.